FROM: Zachariah Wiedeman, B to Z Creative, Inc.
Flagship Merchant Services Operations Dept. In December 2012, I contacted Flagship Merchant Services to inquire about an online payment solution that I could incorporate into my website and invoicing system. They signed me up for a credit card processing service with Authorize.net which also included processing payments through FirstData. I was assured that the Authorize.net software I was signing up for was designed to work with any system. However, the software service provided by Authorize.net was incompatible with my website and invoicing. After several weeks of back and forth, I was told by Authorize.net’s technical support that in order to make the payment processing system work I would need to sign up for additional services at a higher rate. On January 2, 2013, I contacted John Vozzella at Flagship Merchant Services and informed him I wanted to discontinue service. Vozzella did not get back to me and I left him two voice messages over the next few days. I emailed him again as well as operations@flagshipmerchantservices.com contact I had and received a response from Vozzella on January 11, 2013 directing me to an 877 number which connected me to FirstData. I spoke with a representative at FirstData (who never identified that I was contacting FirstData, I thought I was speaking with Flagship Merchant Services at the time) about canceling my account. I informed him of my previous emails attempting to cancel the account through John & FMS Operations, and he told me he would process the cancellation immediately. I asked him if there was any follow-up that I needed to do, and he directed me to contact Authorize.net directly to cancel the arrangement which was set up on my behalf with them as well. Note, this individual never mentioned sending me a special cancellation form via fax, email, or mail – he simply said he would process the cancellation. I called Authorize.net and discontinued the charges with them over the phone and I thought that was the end of that. Meanwhile, FirstData continued to charge me a monthly fee even though I had already expressed my desire to cancel service in writing several times as well as over the phone. Also, FirstData had the wrong mailing address for me and according to Kathleen Fitzgerald (FirstData) received all the mail (invoices) they were sending to me back marked as “Return to sender.” Fitzgerald also informed me that FirstData was contacted by the individual at the wrong address they had been sending my invoices to and was informed that the address they were sending my mail to was wrong. FirstData told this individual they would not stop sending him my mail because he was not authorized to make changes to my account. Instead of reaching out to me via phone, fax, email, or my business address – all valid forms of communication which FirstData has on file for me, FirstData failed to alert me to the problem or even inform me that an unauthorized individual had called in on the account requesting changes in the mailing address. One week ago, I discovered that my bank account was over-drafted as a result of all the fees from FirstData over the past six months which I was not aware were being withdrawn from my account. 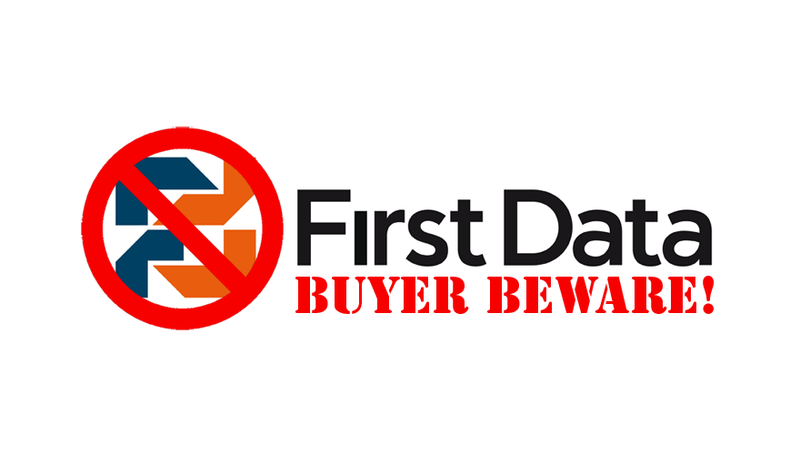 I never received any statements, invoices, and I never processed a single credit card transaction through FirstData. What is worse, is that even if I had wanted to process a credit card transaction I was incapable of doing so because I did not have any equipment or software. So, basically FirstData was taking money from me in exchange for a service I did not know I had nor was capable of using. FirstData took my money. I received nothing in return. There is certainly something wrong with that situation, wouldn’t you agree? Furthermore, to my surprise instead of the “normal” $42.90 FirstData was taking out of my bank account without my knowledge, I discovered a pending charge this month from FirstData for $141.90 (which I have subsequently reported to my bank to be rejected as a fraudulent charge). I would love to hear an explanation of how and why FirstData is attempting to take $141.90 out of my bank account this month. It is almost as if they knew I wasn’t noticing these charges even though I wasn’t using the service and decided to get greedy and see how much more they could steal from me without my noticing. In fact, according to the amount I signed up for which FirstData charged me in January – $32.95 – even $42.90 would have been an unauthorized increase in service fees which, again, I was never informed of by FirstData – despite the fact that they have two mailing addresses for me in addition to my phone, fax, and email. In light of all this information, I attempted to request a refund through Robin McDanial over the phone who, after hearing the situation I just explained above, told me she agreed with my grievance and would request a refund be issued to me. However, after waiting several days, McDaniel got back to me and told me she would not request a refund. In all of my dealings with FirstData, my experience has been that FirstData representatives say one thing and then do the opposite. This is very frustrating, and does not seem like the standard business practices of a company that small businesses trust to handle their financial transactions. It also doesn’t seem to make much business sense to treat a small business person who is in the business of providing other small businesses with recommendations on operations solutions (including payment processing solutions) in this unfair and unprofessional manner. From the very beginning, it felt like I was offered a bait-and-switch service because after I signed up I found out it would not work unless I paid more money for a higher level of service. For that reason I never was able to successfully implement the payment solution I signed up for and never once used any of FirstData’s services. That alone should entitle me to a full refund on every charge FirstData has ever made against me from day one. However, I am not even asking for that. All I am asking for is the $214.50 in fees FirstData charged me + the $257 in overdraft charges which were caused by those fees processing without my knowledge. For a small business like mine, struggling to pay my rent and put food on the table with my earnings, that $461.50 can make a huge difference and I would be extremely pleased if you would do the right thing and make this right. I understand that you may feel you are not entitled to pay my bank overdraft fees. We could probably have a very lively debate about who is responsible for fees incurred by charges that were arguably fraudulent, but rather than have that argument I would like to extend you the benefit of the doubt and simply settle for $214.50 in refund. After all, the least you could do is give back the money you took from me without providing me a service. I am pretty sure FirstData is in the business of making profits by creating value with the service they offer, not by gaining by swindling helpless small business owners who never received any service or value from them (and, I might remind you: I was not even capable of using that service after the Authorize.net service was canceled on January 11th). After all the frustration and hardship you have put me through – especially over this last week – I feel it is almost my obligation to contact the Better Business Bureau and consumer advocacy services in every state to inform them of how difficult and damaging it is to not do business with you (I can only imagine how difficult it is to actually do business with you). Having previously owned and operated a local newspaper in Chicago, I am sure many of my media contacts in Illinois would find this kind of story about a big financial services company walking all over a small business owner to be very compelling as well. However, I understand that mistakes happen, and although FirstData has made several in their dealings with me thus far, I still want to give you the benefit of the doubt that you are an honest, upright company, and offer you a chance to make this right. Again, I am 100% willing to drop this matter and pursue no further action with you if you simply refund me the $214.50 that you took out of my bank account in February, March, April, May and June. If you want to make me truly happy and raise my opinion of you – and the opinion I share with others about you – then refunding the full $461.50 that you have cost me in the past six months would accomplish just that. Hopefully it shouldn’t take you more than a week to take that important step of making restitution and correcting this messy situation. Please note that I have attached a spreadsheet to my email version of this request that details all the bank transactions and fees incurred as a result of you charging me for a service that I neither wanted nor was even capable of using. Thank you for your time. I look forward to a speedy resolution to our differences.